This is a photograph of the Charles Hadsell house that was built near John Brown's fort, close to the Marais des Cygnes massacre site. On May 19, 1858, Missouri border ruffian Charles Hamilton and some 30 other men rode through the village of Trading Post, Kansas, where they captured 11 free-state men. The Missourians marched them into a ravine where they opened fire upon them. Five of the men were killed, five were seriously injured, and one escaped unharmed. John Brown, arriving at the scene toward the end of June 1858, built a "fort" some 220 yards south of the ravine. The land on which the fort was built belonged to Eli Snider, a blacksmith. Later he sold it to Brown's friend Charles C. Hadsall, who agreed to let Brown occupy it for military purposes. Brown and his men withdrew at the end of the summer, leaving the fort to Hadsall. In later years Hadsall built a stone house adjoining the site of Brown's fort, enclosing the spring within the walls of the first floor. In 1941 the Kansas legislature authorized acceptance of the massacre site, including Hadsall's house, as a gift to the state from the Pleasanton Post, Veterans of Foreign Wars. In 1961 it provided funds for the restoration of the building, and, in 1963, the entire property was turned over to the Kansas Historical Society for administration. A museum was established in the upper floor of the building in 1964. Today the park is operated as Marais des Cygnes Massacre State Historic Site. It was added to the National Register of Historic Places in 1971, and as a National Historic Landmark in 1974. 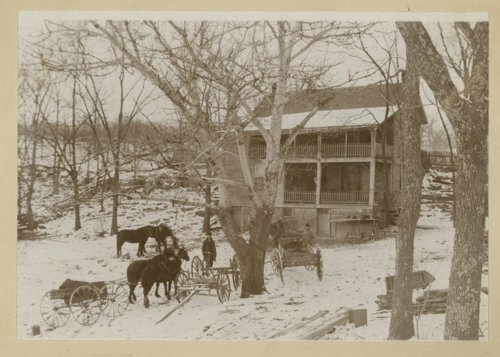 This is a photograph of the Charles Hadsell house that was built near John Brown's fort, close to the Marais des Cygnes massacre site. On May 19, 1858, Missouri border ruffian Charles Hamilton and some 30 other men rode through the village of Trading Post, Kansas, where they captured 11 free-state men. The Missourians marched them into a ravine where they opened fire upon them. Five of the men were killed, five were seriously injured, and one escaped unharmed. John Brown, arriving at the scene toward the end of June 1858, built a "fort" some 220 yards south of the ravine. The land on which the fort was built belonged to Eli Snider, a blacksmith. Later he sold it to Brown's friend Charles C. Hadsall, who agreed to let Brown occupy it for military purposes. Brown and his men withdrew at the end of the summer, leaving the fort to Hadsall. In later years Hadsall built a stone house adjoining the site of Brown's fort, enclosing the spring within the walls of the first floor. In 1941 the Kansas legislature authorized acceptance of the massacre site, including Hadsall's house, as a gift to the state from the Pleasanton Post, Veterans of Foreign Wars. In 1961 it provided funds for the restoration of the building, and, in 1963, the entire property was turned over to the Kansas Historical Society for administration. A museum was established in the upper floor of the building in 1964. Today the park is operated as Marais des Cygnes Massacre State Historic Site. It was added to the National Register of Historic Places in 1971, and as a National Historic Landmark in 1974.